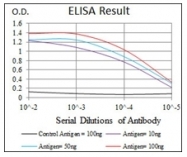 HSF4 monoclonal antibody (M01), clone 1A4 Western Blot analysis of HSF4 expression in A-431 ( Cat # L015V1 ). 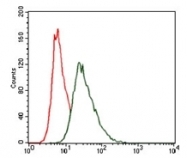 HSF4 monoclonal antibody (M03), clone 3G3 Western Blot analysis of HSF4 expression in A-431 ( Cat # L015V1 ). Western Blot analysis of HSF4 expression in transfected 293T cell line (H00003299-T01) by HSF4 MaxPab polyclonal antibody.Lane 1: HSF4 transfected lysate(50.82 KDa).Lane 2: Non-transfected lysate. Western Blot analysis of HSF4 expression in transfected 293T cell line (H00003299-T02) by HSF4 MaxPab polyclonal antibody.Lane 1: HSF4 transfected lysate(50.82 KDa).Lane 2: Non-transfected lysate. Western blot analysis of Heat shock factor 4 / HSF4 (N-term) Antibody (N-term) Cat.-No AP52116PU-N in HL-60 cell line lysates (35ug/lane). This demonstrates the HSF4 antibody detected the HSF4 protein (arrow). 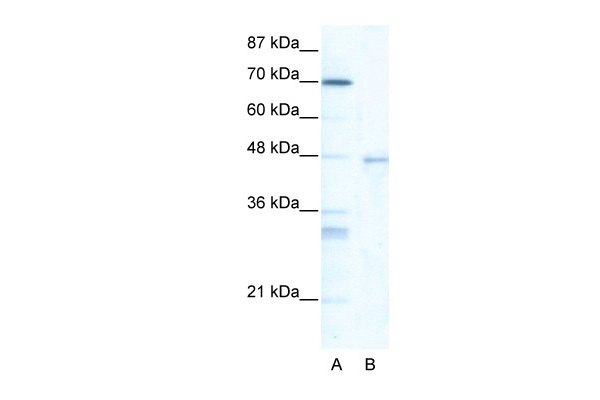 Western blot analysis using HSF4 antibody Cat.-No AM06748PU-N against human HSF4 (AA: 245-411) recombinant protein (Expected MW is 42.9 kDa). 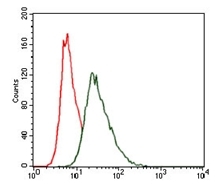 Flow Cytometric analysis of HeLa cells using HSF4 antibody Cat.-No AM06748PU-N (green) and negative control (red).